From rustic villas to humongous beach mansions, we bring you daily architectural discoveries for your aesthetic delight. Today’s gem comes from UK-based AR Design Studio – a modern masterpiece worth taking note of. A three-year long project with a theme based on new beginnings, natural light and fresh air. This luxury four-bedroom abode boasts expansive views of the surrounding Winchester’s striking countryside. Working from a concept to maximise the views, the designers opted to give each key room an outlook across the landscape, while simultaneously resisting the standard domestic layout. 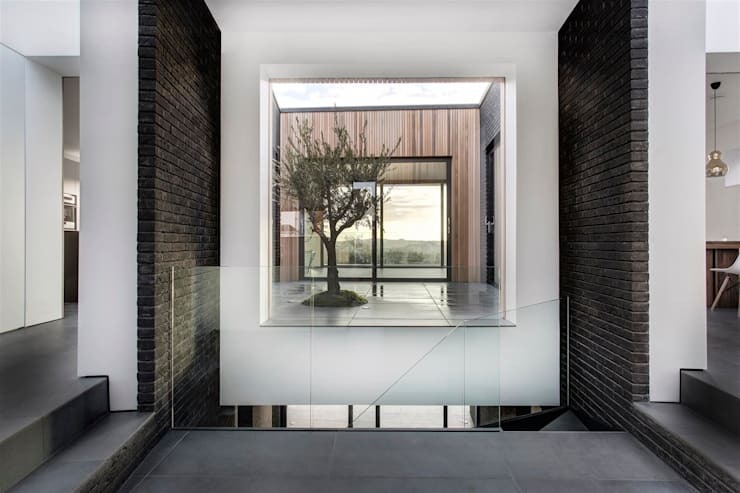 Instead they adopted an “upside-down” living style, splitting the house into two halves: public (with landscape views) and private (overlooking the interior courtyard garden with a single olive tree). 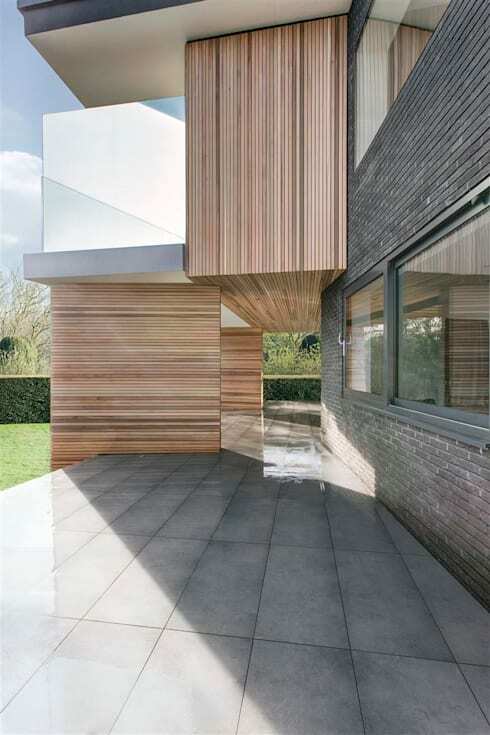 And did we mention that a magnificent amount of cedar was used to maximise the house’s visual presence? Let’s discover this residence’ unique appeal. It’s what’s inside that’s important – and in this case, that is most certainly true. The warm and golden glow from the interior lighting casts a powerful spell on the house’s exterior façade, making the entire house light up from within. From this angle in the backyard, it is clear that the architect's vision of open and fresh spaces has been well achieved. Notice how unique the house’s modern design contrasts with the more classic silhouettes next door. A patio that also serves as a multi-purpose living area, regardless of the weather. Perfect! That stunning cedar coating wraps itself fantastically around the house, injecting a raw yet stylish natural feel to the residence. And its colour plays fantastically with the neutral tones of the brick and tiles. The use of cedar wood throughout the house, mixed with the generous amount of natural lighting, achieves a supreme feeling of well-being and pleasantness. 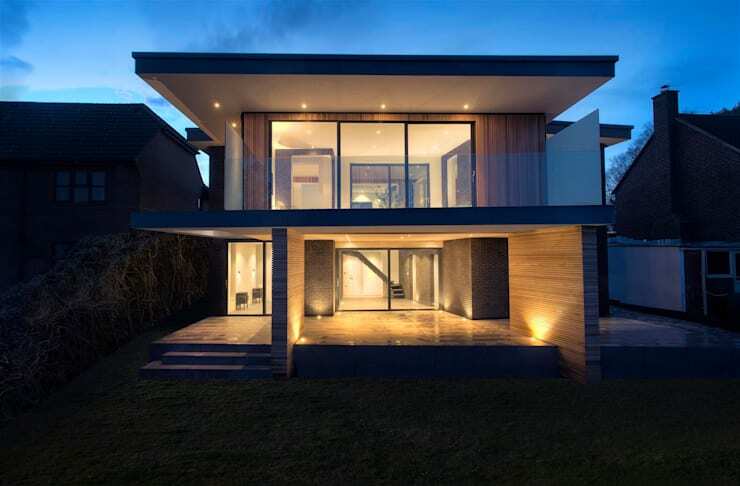 It also brings the house closer to its natural surroundings. Perfect for landscape views or simple relaxation – see our exceptional balconies, porches and terraces here on homify. What could be better than an exterior garden? How about an interior garden, placing a strong link with Mother Nature right indoors? Although this small patch of garden is really just an inner courtyard, it still does a terrific job of adding a natural element of peace and prosperity to the indoors – an olive tree. Right behind is where we can catch the majestic view of the Hampshire countryside, filling up the horizon and extending the house’s link with a green, undisturbed environment. However, thanks to the abundance of windows and sliding doors, views of the lush landscape are an unbroken delight throughout the house. A simple design that resulted in a stunning vision. 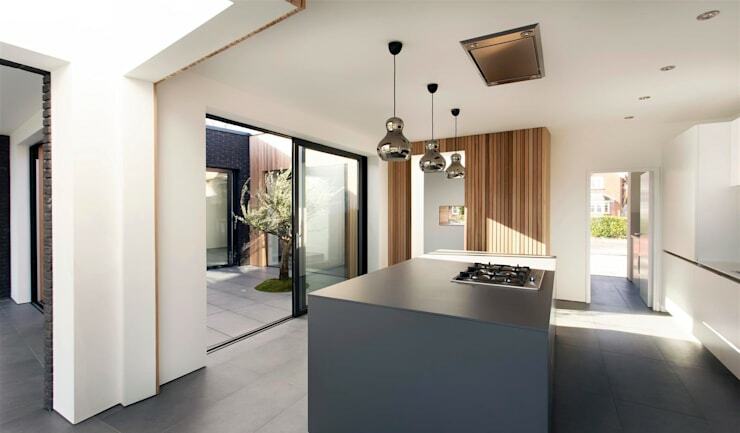 The open-plan kitchen is found on the upper floor of the house, extending into the dining room and offering continuous views of the inner courtyard. Here we get a fantastic glimpse of the three main colour tones used throughout the house: a pristine white, the honey-toned colour of the cedar, and a dramatic grey. 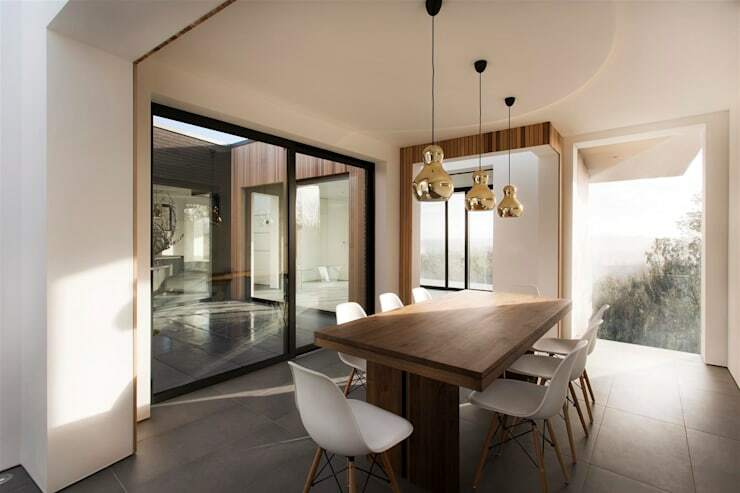 Of course natural lighting can be counted as a fourth palette, adding a healthy glow onto the internal hues and ensuring an interesting play of light and shadows throughout the day. On the other side of the upper floor is where we find the dining space. This area provides optimum views to accompany the evening meal: we have that inner courtyard for a safe and undisturbed link with nature, and then the balcony that looks out onto the more natural, rugged environment outside. Red-wine views, indeed! Continuing the homage to wood is the dining table, boasting an impressive hardwood surface that fits in beautifully with the interior colour palette. Bathrooms are required to provide a certain amount of privacy – which means that they also subtract a definite amount of contact with the outside views. It happens very rarely that a bathroom offers prime, panoramic views of the surrounding landscapes. Well, a second best option would be to coat the entire one wall in a golden finished tile to replicate a warm sunshine. A stylish alternative, indeed. Together with the rest of the bathroom’s lighter colours (frosted glass, white porcelain and pristine clean concrete), this makes this room truly one of the more unique spaces in the house. Let’s revel in some more: Bathroom Options That Will Floor You.